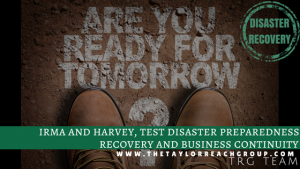 Disaster Preparedness and Business Continuity Planning | The Taylor Reach Group Inc.
A disaster? It’ll never happen to your business or Contact Center. There hasn’t been a major storm in your area in living memory. That kind of stuff happens to centers in Tornado Alley and Key West, not where you are. Don’t be so sure—there are many kinds of disasters and any one of them could visit your center today. Cheyenne, Wyoming is high plains desert, getting only 12 inches of rain a year. It was the last place you’d expect a flood. But on August 1, 1985, Cheyenne got more than six inches of rain in less than four hours, and the resulting flood killed 12, injured many more, and shut down many businesses for days or weeks. In the 1950’s, the US Navy moved its entire fleet of planes from Pensacola, Florida, to Olathe, Kansas, the night before a predicted hurricane in Pensacola. The next day was beautiful in Pensacola…and a tornado hit Olathe and destroyed the fleet. Disasters come in all shapes and sizes, and they are, by definition, unpredictable. In addition to weather, we can have lines cut, power outages, train derailments, flu epidemics, and so much more. Now is the time to prepare. a. Evacuation: Wildfires, floods, hurricanes, disease, and train or truck related collisions can all cause the need for evacuation. You will need to not only have an evacuation plan, you will also need to determine what treatment callers and contacts will receive during your evacuation process. For example, will caller be directed to a recorded message, will the calls be redirected to another center, will the calls be redirected to the same agents once they at a hot-site or other remote location(s), etc. b. Power outages: Diesel powered generator, with battery backup to keep the computers up during those seconds before the generator kicks in. Test it regularly, have preventive maintenance done, keep it filled with fuel, and enter a contract with a company that can provide more fuel in a long-term outage. System outage: Backup systems in at least two different geographical areas, regular backups kept offsite in secure storage. Unable to reach the center for weather, infrastructure or health reasons: systems that allow work from home, with equipment like laptops and headsets available at a convenient location away from the center or at agents’ homes; contracts with backup centers that agents can travel to; agreements with companies whose agents can take your calls in a disaster. Remember that while some disasters may only last for a day or two, others could be weeks. How would 2 weeks without power impact your plan? 1) Preplan for Disasters: Preplan what to do in each type of disaster. Consider the differences between being denied access to the office due to road blockage versus the office being non-functional, aka flooded. In one case, we had a direct experience with a client where the center was cut off by repeated snowfalls that stopped anyone from getting into the office for over a week. The office was functional but unreachable. But, since the firm had a work from home program running for many years, they did not have to move to their backup center over 2 hours away. Luck or good planning, you tell me. 2) Document Your Disaster Recovery Plan: Document, document, document the plan and make sure everyone knows their part. From who can declare an emergency, to who can authorize carriers to implement emergency routing, and of course who can or will declare an emergency over, and how will that be communicated to everyone. 3) Business Records: Make sure to have offsite or cloud records, preferably electronic and available on a moments notice. For Call and Contact Centers (CC’s), this means the Customer Relationship Management system (CRM) and other systems should be available to you in locations other than head office. If you can already work from home, you already have the infrastructure to do this. 4) Redundancy is Mandatory: Does the data center provide redundancy with another center not anywhere near either the office or data center? If not, get one. Without the data, your business is dead in a few days or weeks at the longest. This is your best insurance and protection in order to stay in business. 7) Informed Employees: Ensure all employees know the plan and what they can and should do, when. 8) Emergency Messaging for Employees: Establish an emergency IVR/Auto messaging or collaboration tool to reach out to and coordinate with all current employees with timely and critical information; from the basic, ‘Don’t come into work’ to ‘All clear, return to work in X days’. Messages can include assembling points or locations to continue working etc. Some systems can be set up to dial each employee to ask their status and whether or not they can work, are they OK etc. 9) Emergency Messaging for Clients: Provide emergency messaging for all clients, callers etc. across all channels in advance of needing them. Check and trial this works before using it. Most suppliers are happy to do a quarterly test of emergency routing of calls or message intercepts during both work and non-work hours. Be proactive. 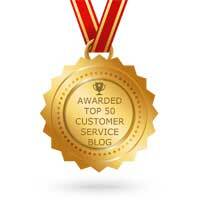 The more detailed information you can provide the better; don’t leave your customers guessing. Utilize multi-recipient/bulk channels. Reach as many customers as you can before they attempt to reach out to you and clog your 1:1 channels. Make sure front facing customer channels like your websites and their links work. This is not the time to have dead-end links or incorrect contact information posted. 10) Long-Term Plans: Provision for a loss of the complete office and center for the long term. Where will you move, when and under what conditions? There are times when disaster recovery plans are put in place, however, they still seem to fumble in miscalculations. a. Ensure your disaster recovery plan considers the worst-case scenario. Only having 2 days’ worth of fuel for your generator won’t do if a hurricane can knock out power for a week or more. b. The alternate site is geographically too close to the main site. In situations such as natural disasters, it is important to consider where your alternative location is in respect to the main site and the likelihood of the secondary location receiving similar impact to ultimately cause postponement of operations. c. Practice makes perfect. Much like we practiced fire-drills in school, it is important to practice implementation of a disaster recovery plan, systems, processes, and protocols. One outsourcer we know redirected calls between two geographically diverse centers quarterly as a live test of re-routing and to ensure a level of proficiency. This will ensure a smoother flow in actual times of emergency. Have a plan C, & D. Disaster Recovery is never fully tested until the disaster happens and by then it will be too late to rethink or reassign assets. Proper planning is essential to a smooth and effective business continuity plan. Don’t allow your center to be a victim, plan and prepare for disasters and you and your employees can survive and continue to support your customers and clients. For more information assistance with developing a disaster recovery plan for your business and Contact Center, reach out to our CEO, Colin Taylor.